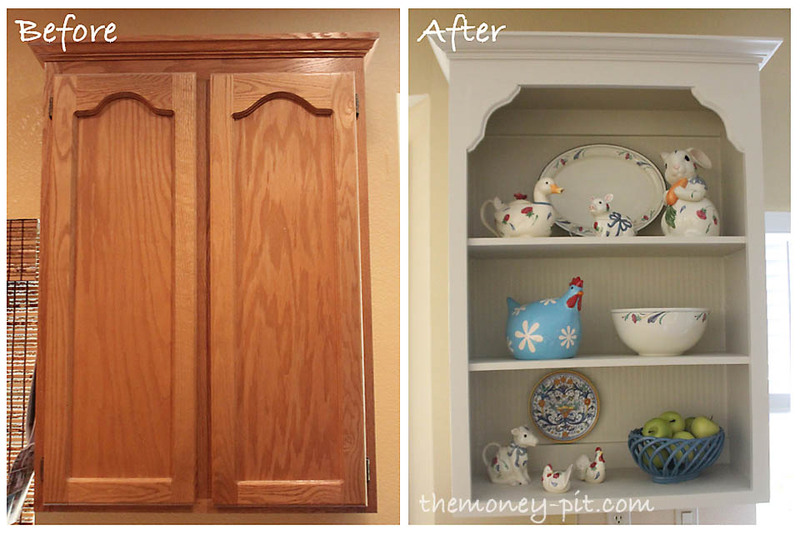 Since I am redoing my kitchen, but working within a budget and with the cabinets I already have, I needed a way to get a more custom look. Enter: Open Shelving. (EDITED TO ADD: Full kitchen reveal can now be found here) It was a look I had pinned dozen of times on my "Kitchen" Pinterest board, but I didn't want it to look like I just took doors off a cabinet. I wanted it to look CUSTOM. So I looked around my kitchen and tried to figure out which cabinets I could easily convert yet wouldn't look like doorless cabinet boxes. 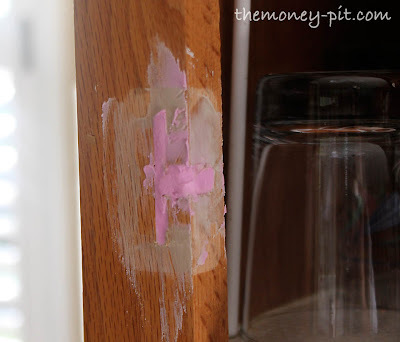 I was happy with the look, so I needed to deal with the hardware holes leftover from the hinges: A couple dollops of spackle (I love the pink kind that dries white) did the trick: Then I went ahead and removed the center support post (which really isn't "supporting" anything but the doors). 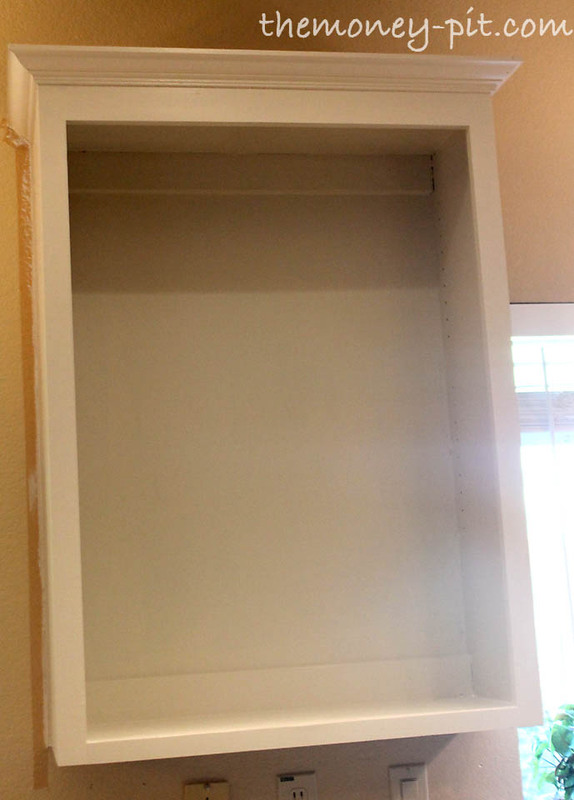 I used a hacksaw to cut it in half and knocked it out with a hammer: Next up sanding and priming: A couple coats of paint (yes, this is the Manchester Tan I took forever to decide upon): Most people would have stopped there, but this doesn't look like much more than an empty cabinet. 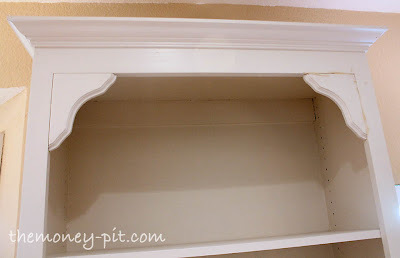 I took my inspiration from the open cabinet I loved on Pinterest and found these shelf brackets: I added them to the top corners of the cabinet and ended up with this: More spackle and another coat of paint.. but I didn't want to stop there. My inspiration cabinets also had a beadboard backing. Where have you been all my life? This stuff is great. And although I have heard it can't handle a lot of wear and tear (so I wouldn't use it on a bathroom wall for example) it would have been a great solution to my DIY beadboard ceiling. 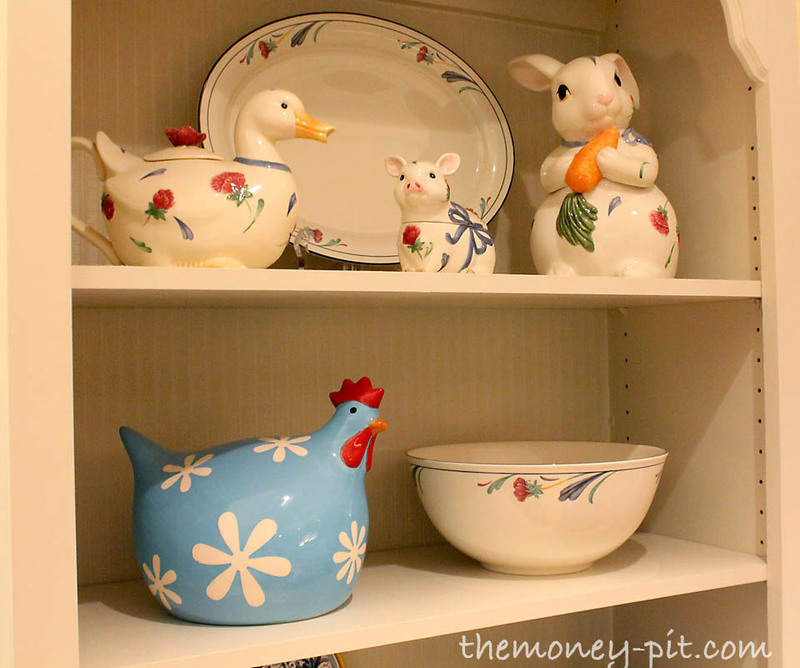 Of course I added my $2 chicken (affectionately named Beyonce) that I couldn't pass up at the thrift store. And there you have it! Not too difficult! Here is what it looks like from a distance. 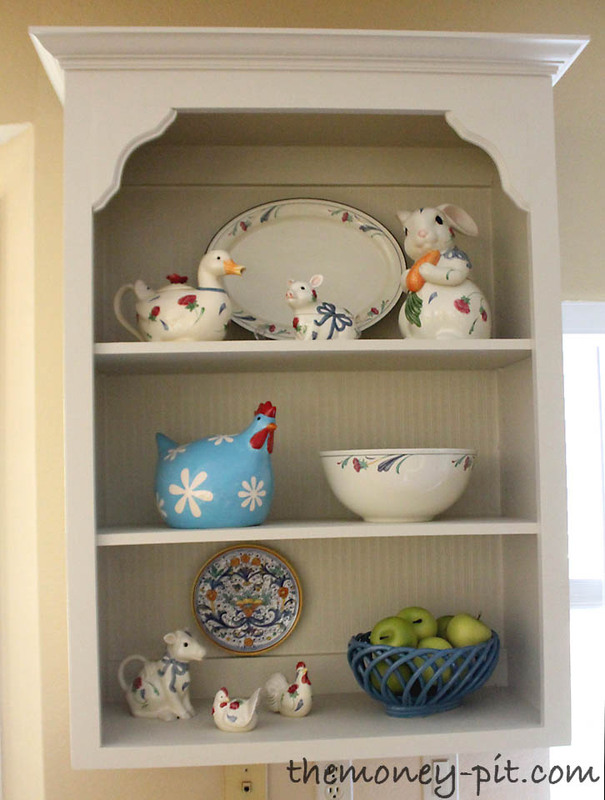 Not so much like a converted cabinet! I am super happy with it! 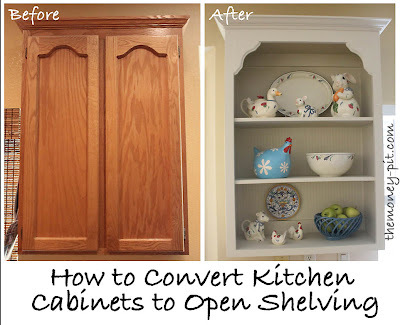 That's absolutely awesome and it doesn't look like a converted cabinet AT ALL! It looks like a whole new piece of furniture ... and expensive, too. 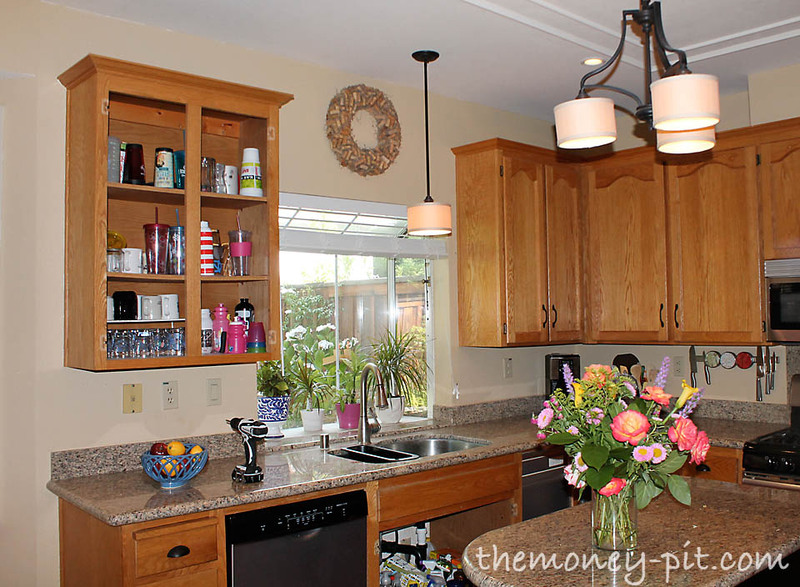 Your kitchen will turn out absolutely fabulous! Great job! I love it. It looks like a seperate piece of furniture. Thank you for sharing the beadboard wallpaper! I had not heard of that. 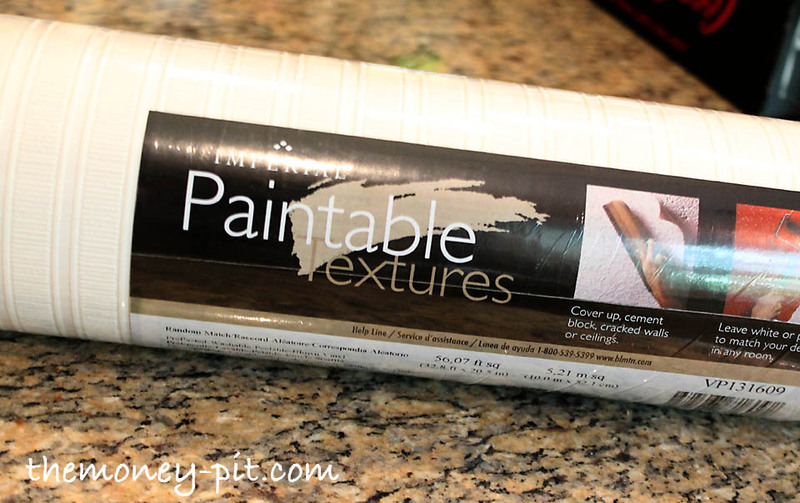 I want to do a closet ceiling and pantry ceiling with that! 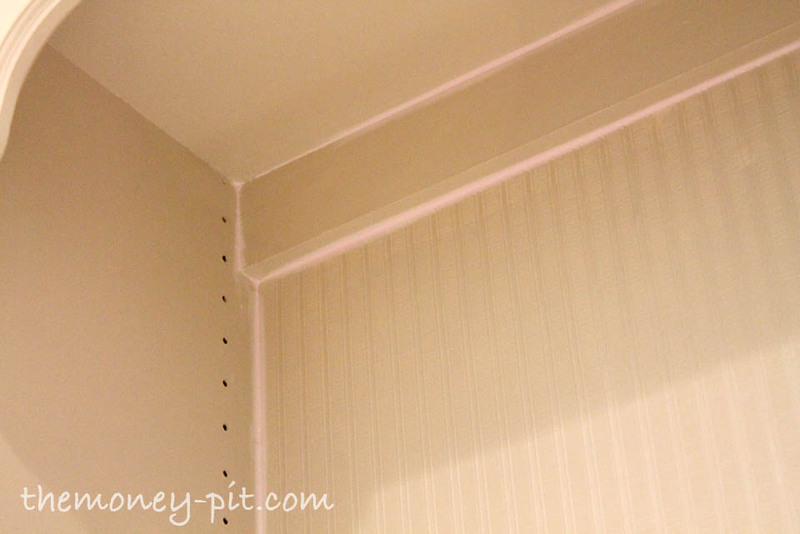 If I get industrious enough I will do the back wall of the pantry. I redid a kitchen cabinet years ago to look like a seperate hutch. I need to dig up the old "before" photos! You NAILED it! Totally lost the cookie cutter kitchen look and am in love with your bead board wall paper. 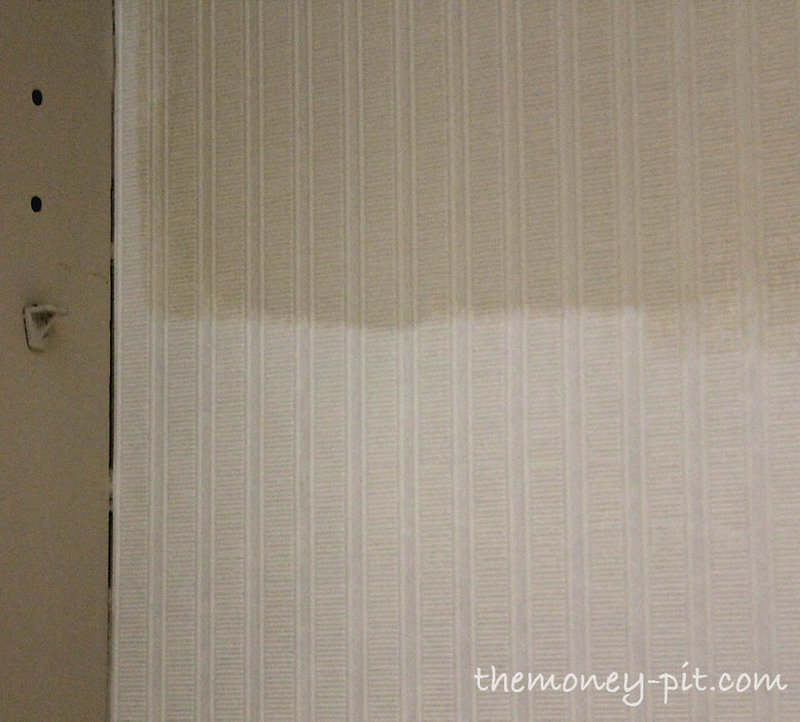 I know you mentioned that it cant' handle wear and tear, how do you think it would hold up on the walls going down to the basement? what a transformation! that looks amazing! that looks so ridiculously good! ah, what one can do when one can paints! if i removed my doors, there'd be no painting and it'd look super cheesy. **Big smiles** That looks so great! I'm always impressed with your take charge attitude. You did a great job and it looks professional. Beautiful transformation....loving it all & thinking about being a copy-cat!! :) Blessings! 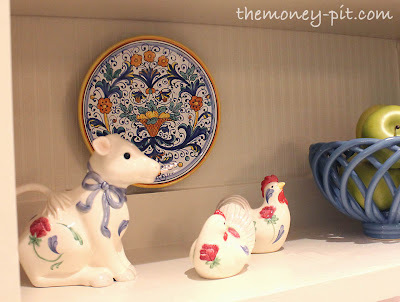 You did a great job of making this look like intentional open shelving! 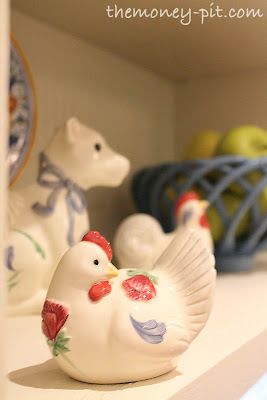 I love this look, but don't have a place in my kitchen where it wouldn't look contrived. 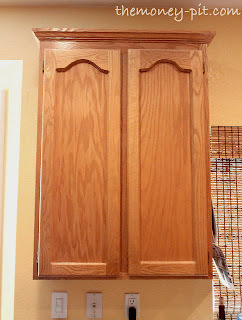 I was just talking with my sister about how she wants to redo her cabinets. I'm going to show her this! Thanks for sharing! This is so great! Love it and so inspiring. I hope you will link this up to The CSI Project this week. The challenge is Kitchen makeovers and decor.Tomorrow the competition will start. 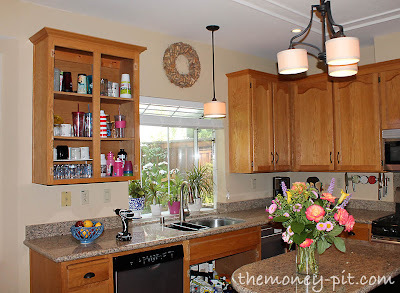 Come on over to see kitchen tutorials. PS I am going to feature this on my FB page!!! This looks great! 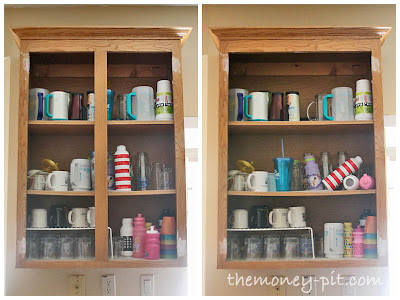 I've been toying with the idea of doing that to one of the cupboards in my kitchen and I think this has convinced me! Pinned! Wow! What a great idea! I love that paintable wallpaper/beadboard! Your cabinet-turned-open-shelves turned out beautifully! 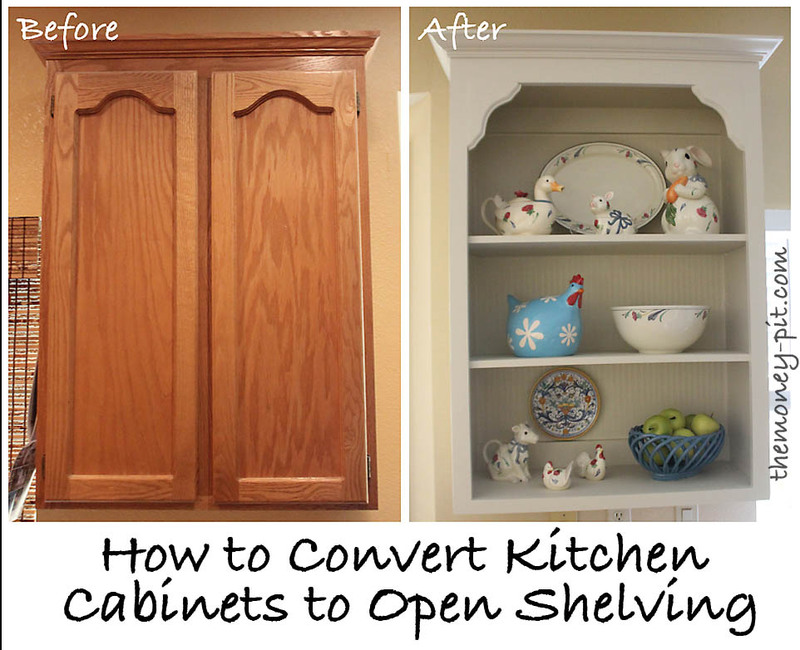 I've been wanting to do this to a few of the cabinets in our kitchen (once we have the extra $$), and now I know where to go for the perfect tutorial! Thanks so much! Wow, that is absolutely gorgeous. What a transformation. It's such a great idea. Great inspiration and great blow by blow instruction! I have just opened up a kitchen cabinate that extends out over the counter and thought I was finished, but now realize that it is crying for the top corner extras! 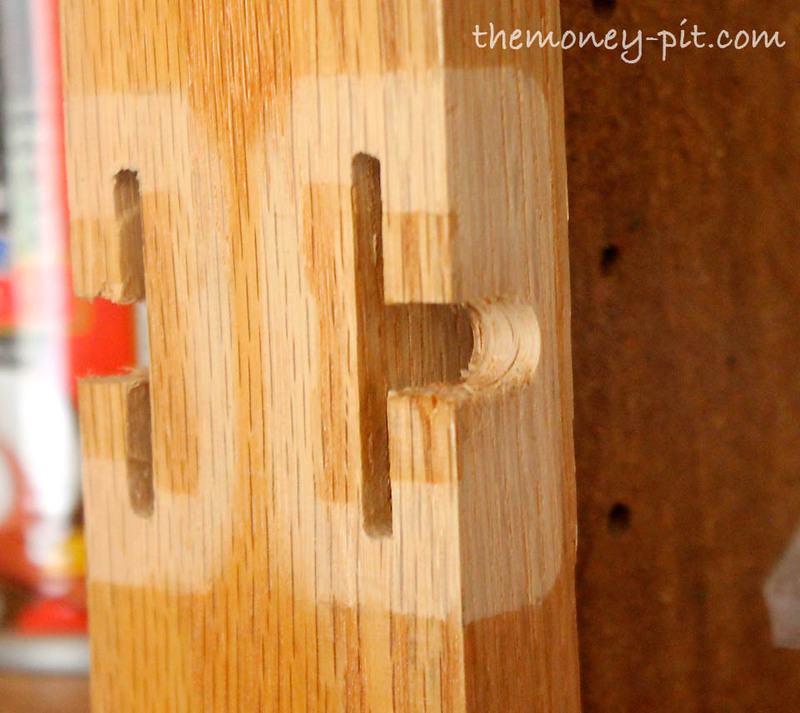 The shelf brackets in the corners make such a huge difference in the look. Great job and terrific instructions! You did a great job and it's gorgeous!! Happy weekend. I've been thinking about doing this for a while now and this post has pushed me right over the edge! Thanks for the push! Wow! 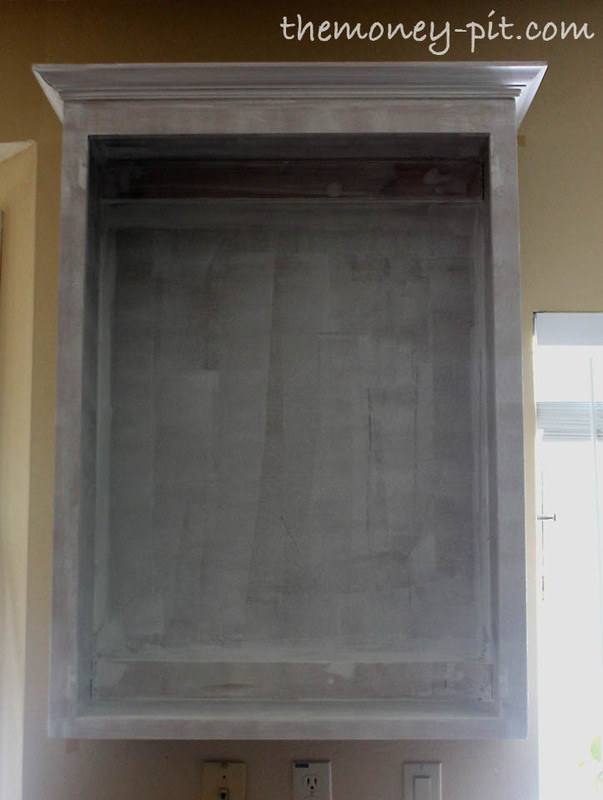 That certainly looks like a custom display cabinet and not a cup cupboard!! Great job! Thanks for the DIY details and the inspiration!! 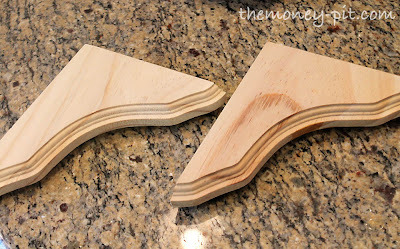 The brackets added & removing the center support really do add so much to the final result, but I am posting to say how much I love your serving pieces!! They are adorable, I hadn't seen this design before. Oh my gosh! Looks fantastic! Look at what you get with lots of hard work! Great upgrades - very pretty! oh my gosh, love the new look of your open shelving cupboard! tooo pretty! This is fantastic! I would love to feature this on Reduce, Reuse, Upcycle. Feel free to stop by and grab a featured button. Thanks! So cute! 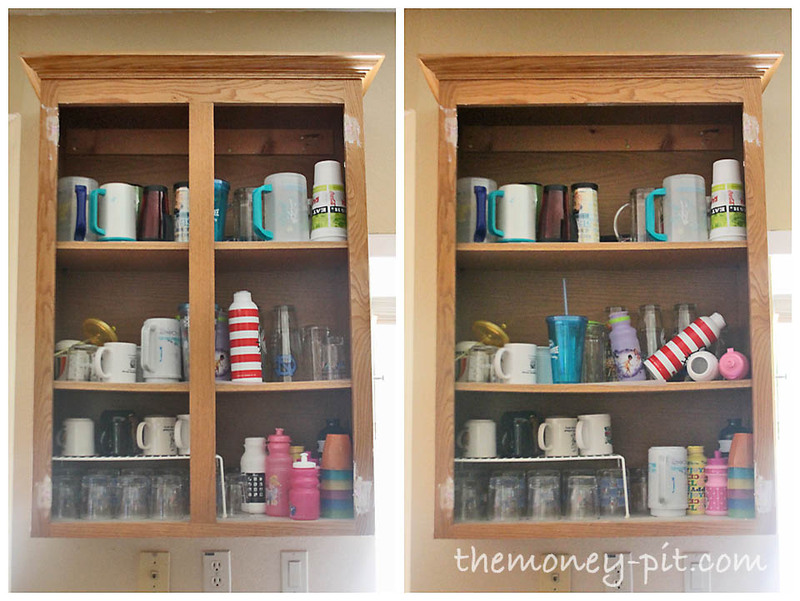 I should do this with a few of my cabinets! This is great. Thanks for the inspiration. New follower! Just gorgeous! Love how you customized this with the simple corners! Genius :-). I want to be you! Love love love it! Thanks for sharing all of your ideas and tricks. 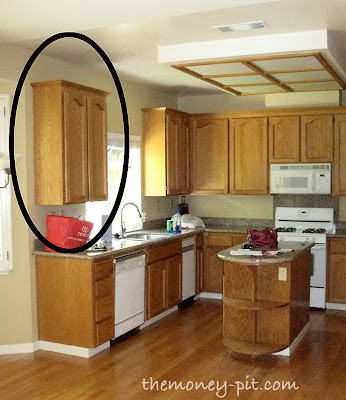 How did you attach the corner brackets to the cabinets? When I click on "framing a mirror without..." it takes me to this. 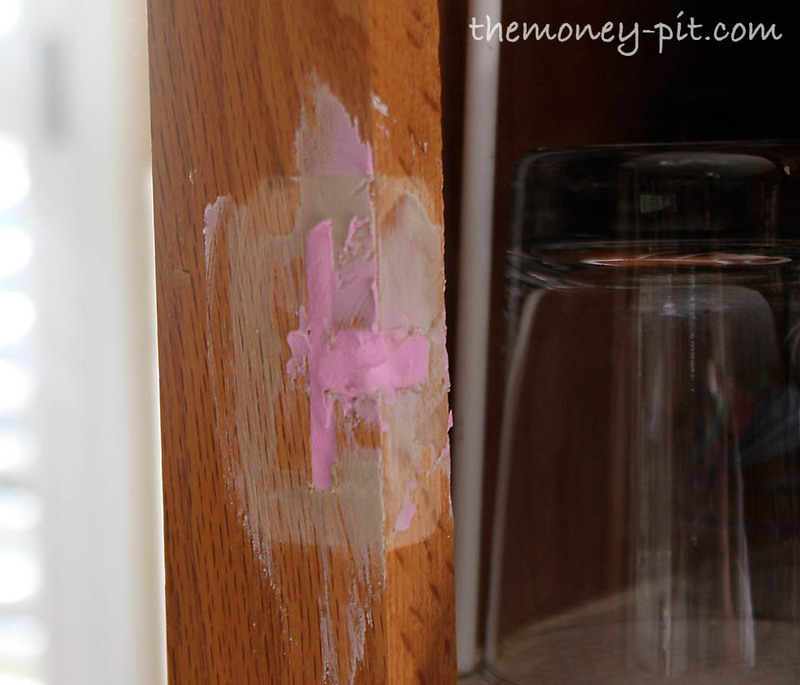 This is just what I've been looking for to save hundreds of dollars on putting new doors on 65 year old cabinets. Thanks for your inspiration! When I clicked on the link to make the mirror frame, it took me to this link for the cabinet. Can you provide the link for the mirror project? Thanks!